The Korea Herald is publishing a series of interviews on promising startups in the financial technology industry. This is the 18th installment. -- Ed. An online crowdfunding platform is a marketplace of ideas. And equipping that marketplace with a convenient payment tool is obviously key for the involved parties -- fundraisers with an idea and backers buying into the idea. For sponsors on Tumblbug, a startup operating an online rewards-based crowdfunding platform for content creators since 2011, paying with credit or debit cards -- or investing in the idea -- is just three clicks away. Once the transaction is made, the investment will be in the hands of the creator after seven days plus seven business days. Using the crowdsourced sum, the creator would be able to publish books or webtoons, go on location for films, commercialize consumer goods and carry out intangible projects like meetups, free of other intermediaries. 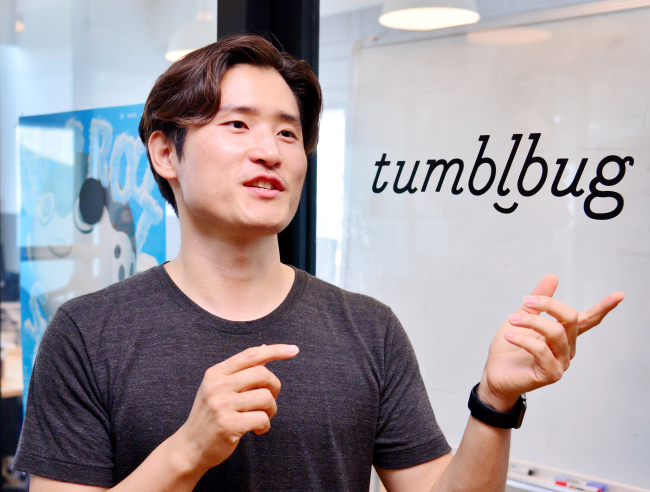 The swift payment system was the reason behind the rapid rise in the popularity of Tumblbug, co-founded by then-film student Yum Jae-seung. “While crowdfunding is aimed at helping an idea be brought to life, an inconvenient payment method would further push away (potential backers),” Yum, the 30-year-old chief executive of Tumblbug, said in an interview with The Korea Herald. The accumulated volume of investment pledged through Tumblbug topped 40 billion won ($35.9 million) as of June this year, up fourfold in less than two years and 40 times higher in about five years. Also, campaign backers’ average rate of repurchasing within 90 days on the platform came to 55 percent as of July, up from around 30 percent in 2015. But so far, all transactions between backers and creators have been domestic ones. What if the Korean equivalent to Kickstarter is able to take investments from international backers through inbound international payment? That is very unlikely for now, Yum said. For card payments, additional security layers such as 3-D Secure protocol are standing in the way, while accepting payments using global payment gateways such as PayPal and Stripe could be limited as a startup, according to Yum. “A method for easy inbound payment (for international backers) is virtually nonexistent in Korea,” he said. 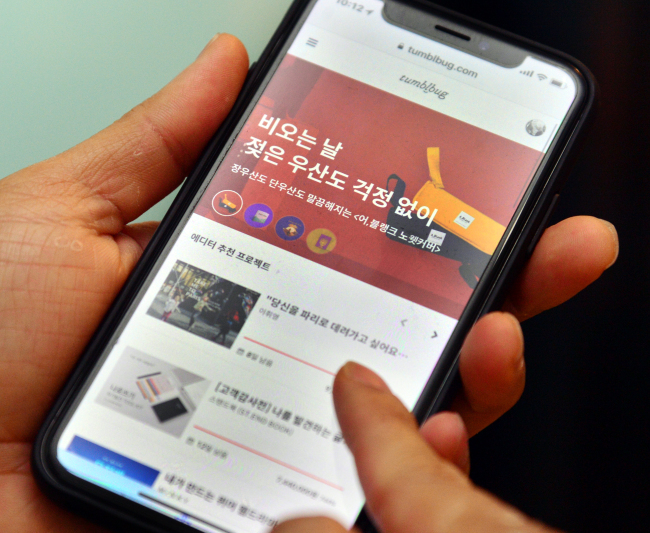 Unless a Korean startup plants an overseas corporation or unless a Korean payment gateway firm partners with foreign counterparts, foreign backers’ inbound payment into Korea is nearly impossible, which would “significantly undermine global competitiveness” of Korean platform operators, according to Yum. The idea of Tumblbug stemmed from Yum’s experience as an undergraduate, studying film editing, cinematography and lighting. Yum graduated from Korea National University of Arts. In contrast to Kickstarter’s success abroad in the early 2010s, the concept of crowdfunding “rarely existed in Korea,” Yum recalled. Also, a void of payment infrastructure in Korea weighed on the startup. Back in Tumblbug’s nascent days, online payments required multilayered software framework like ActiveX, which comes in contrast to Kickstarter that made use of an open application programming interface from Amazon Flexible Payments System, according to Yum. Tumblbug teamed up with a local payment gateway company in 2011 to flesh out a payment system “within three clicks.” Moreover, Tumblbug concentrated on maintaining a certain level of ongoing fundraising projects on its website, with the number currently amounting to some 700. “We found that an increase in the number of active fundraising projects correlates with a rise in the volume of funds raised (on Tumblbug platform),” he said. Alongside a platform for fundraising, Tumblbug has sponsored events for independent creators, such as “Unlimited Edition” for book publishers, and a competition for bakers. During the interview, Yum downplayed the possibilities of adopting an equity-based crowdfunding scheme on the Tumblbug platform. This comes at a time when a company that raised some 700 million won through another Korean equity crowdfunding platform recently faced a bond default. “We do not want to fan a money game (on our platform),” he said.